Ultra-high mileage for GM's electric-drive Volt could give it a marketing boost. 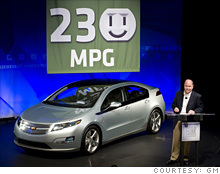 GM CEO Fritz Henderson touted the fuel economy of the Volt on Tuesday in Detroit. DETROIT�(CNNMoney.com) -- The Chevrolet Volt, GM's electric car that's expected to go on sale in late 2010, is projected to get an estimated 230 miles per gallon, the automaker announced Tuesday. That exceptionally high government mileage rating could give the Volt a major boost. For the first time, car buyers will easily be able to compare electric cars with ordinary gas-powered cars. "Having a car that gets triple-digit fuel economy can and will be a game changer for us," said GM CEO Fritz Henderson. Determining fuel economy for an electric car is a tricky matter. While General Motors (GM, Fortune 500) has been working with the Environmental Protection Agency for years on the issue, the agency says it has not tested a Chevy Volt and therefore cannot confirm the fuel economy values claimed by GM. Basically, you will be able to drive the Volt for about 40 miles using the lithium-ion batteries. For those driving less than that, gas mileage is essentially unlimited. It is only after 40 miles that the Volt will start using gas. "Most Volt drivers will operate on a daily basis without having to use a single drop of gas," said Henderson, saying that three out of four drivers travel 40 miles or less a day. Fuel economy for hybrid vehicles like the Toyota Prius is displayed in the same way as it is for any other gasoline-powered vehicle. It gets 46 mpg, for example, versus 19 mpg for a V-6 Ford Mustang. That standard works because all the energy used by the Prius ultimately comes from burning gasoline. The Prius just uses that energy more efficiently than other cars do. The Chevrolet Volt, on other hand, runs on electricity that comes from two sources -- a battery as well as a gasoline engine. When gasoline is providing the power, the Volt might get as much as 50 mpg. But that mpg figure would not take into account that the car has already gone 40 miles with no gas at all. So let's say the car is driven 50 miles in a day. For the first 40 miles, no gas is used and during the last 10 miles, 0.2 gallons are used. That's the equivalent of 250 miles per gallon. But, if the driver continues on to 80 miles, total fuel economy would drop to about 100 mpg. And if the driver goes 300 miles, the fuel economy would be just 62.5 mpg. The Volt will need to be plugged in at night to recharge. The company said it estimates it will need 8 kilowatt hours for the recharge necessary to travel 40 miles. That should cost a total of about 40 cents at off-peak electricity rates in Detroit, Henderson said. National figures from the Department of Energy suggest most consumers would pay more than that, probably around 88 cents per recharge. Even at those modest recharging costs, and limited use of gasoline, it will be difficult for the Volt to save money for their owners, according to auto sales service Edmunds.com. "Even if the Volt's fuel savings could possibly be as dramatic as today's numbers suggest, the expected purchase price will be much higher than that of existing hybrids, and it will take years to pay off its price premium," notes Edmunds.com senior analyst Jessica Caldwell. The fuel efficiency rating is based on the EPA's proposed methodology which GM used in its Volt tests and applies to city driving only. Henderson said GM is confident that when Volt's combined city/highway mileage average is calculated, it will be over 100 mpg. But GM is obviously focused on the 230 mpg estimate as part of its early marketing campaign for the vehicle. It unveiled a logo with the number 230, with the zero looking like a cross between a smiley face and electrical plug. Edmunds officials said they have doubts about the assumptions used to achieve the lofty fuel economy estimate. "For most people, it is not realistic to expect that kind of mileage in real world driving," said Michelle Krebs, a senior analyst. But Krebs said the Volt is likely to get achieve significantly better fuel economy than current offerings, such as the Toyota Prius that gets an estimated 50 mpg. GM started pre-production of the car in June is making about 10 a month. "Volt is becoming very real, very fast," Henderson said. Henderson conceded the cost of building a Volt will be expensive, about $40,000 per vehicle. But he said the vehicle will qualify for a $7,500 tax credit, which will reduce the vehicle cost by that amount for consumers. He also stressed that GM has not set the pricing for the Volt, and conceded the company may have to subsidize the vehicle. The goal: Make enough sales to move the Volt from "first generation" to lower-cost future designs. "The cost of the vehicle in the first generation is high," he said. GM has not given sales targets for the first year, other than to say it will sell only thousands in the first year, and tens of thousands after that. --CNNMoney.com senior writer Chris Isidore contributed to this story.